The aim of this project was to systematically investigate gambling-related harm in Victoria and assess the aggregate 'burden of harm' with reference to different levels of problem gambling, and other comparable conditions. The project used a standard public health methodology endorsed by the World Health Organisation to measure the impact of gambling on quality of life. 15.24 per cent of years lost to disability were from problem gamblers. Harm to self accounted for 86.2 per cent of harm, while 13.8 per cent was harm to others. When all risk categories are combined, gambling accounts for years lost to disability that equates to about two-thirds of the years lost to disability for alcohol use and dependence and major depression, and much more than many other conditions such as diabetes. legacy harms, which occurred long after gambling ceased. The researchers also identified that harms could occur much later in life, or even be transferred between generations. For example, parental poverty could impact on children throughout their lifespan. For the foundation – the improved understanding of the quality and quantity of harm will help to better target efforts to prevent or reduce the potential negative consequences of gambling. For policy makers and regulators – the study concluded there should be a broadening of focus from the prevention of 'problem gambling' to the lessening of gambling harm which is distributed across a broader section of the Victorian community. 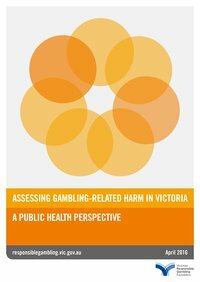 Browne, M, Langham, E, Rawat, V, Greer, N, Li, E, Rose, J, Rockloff, M, Donaldson, P, Thorne, H, Goodwin, B, Bryden, G & Best, T 2016, Assessing gambling-related harm in Victoria: a public health perspective, Victorian Responsible Gambling Foundation, Melbourne.